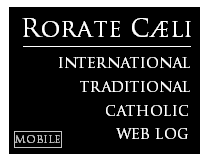 RORATE CÆLI: OP-ED - "The McCarrick Affair: The Pope knew. Here is why he must resign." The author of this affidavit, as La Verita reports today, is Monsignor Carlo Maria Viganò, 77, who, before being sent as Nuncio to the United States, was in charge of the Governorate of Vatican City State, and before that Nuncio in Nigeria, Delegate for the Pontifical Representatives of the Secretary of State of the Holy See and Member of the Disciplinary Commission of the Roman Curia. And the facts follow the words, that is the news. Documented, described in detail. The tone is grief-laden, but the style dry. 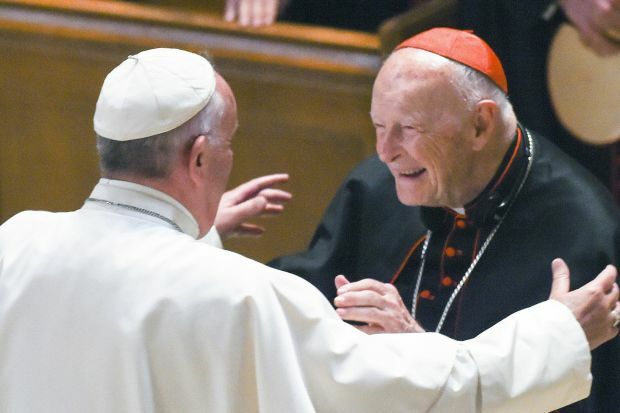 The straw that broke the camel’s back was the case of Cardinal McCarrick. When he saw that the entire hierarchy of the Church were taken aback when faced with the wicked deeds committed by “Uncle Ted” which have emerged in plain evidence over the last few months and so much so that there were a flood of “I didn’t know[s]”, Monsignor Viganò started writing. An indictment which begins way back, before Francis’ pontificate, and reaches the present day. Viganò reports that two former Nuncios of the United States, now both dead, prematurely, that is Gabriel Montalvo (in service from 1998 to 2005) and Pietro Sambi (who covered the office from 2005 to 2011), “ did not fail to inform the Holy See immediately, as soon as they learned of Archbishop McCarrick’s gravely immoral behaviour with seminarians and priests.” But no-one did anything. In particular, Viganò reveals that “the Nuncio Sambi transmitted to the Cardinal Secretary of State, Tarcisio Bertone, an Indictment Memorandum against McCarrick by the priest Gregory Littleton of the diocese of Charlotte, who was reduced to the lay state for a violation of minors, together with two documents from the same Littleton, in which he recounted his tragic story of sexual abuse by the then-Archbishop of Newark and several other priests and seminarians. The Nuncio added that Littleton had already forwarded his Memorandum to about twenty people, including civil and ecclesiastical judicial authorities, police and lawyers, in June 2006, and that it was therefore very likely that the news would soon be made public. He therefore called for a prompt intervention by the Holy See”. As Delegate for Pontifical Representations, in 2006, Viganò writes a memo on the Littleton case and sends it to Cardinal Tarcisio Bertone and the Substitute Leonardo Sandri. He states that the behaviour attributed to Mc Carrick is of such gravity and wickedness as to provoke bewilderment, but the accusations are accurate and there is mention also of sacrilegious celebration of the Eucharist with the same priests involved in the depravations. Consequently, in his memo Viganò asks, forcibly, for once, that the ecclesiastical authorities intervene before the civil authorities and before the case breaks out in the press. It would be salutary. But there is no reaction from his superiors. And the memo is never returned to him. Viganò doesn’t give up and returns to the office in 2008. Richard Sipe , psychotherapist and expert in the sexual behaviour of priests and their superiors, that same year, writes a letter to Benedict XVI wherein the title says it all: “Your Holiness, I Have the Evidence . Cardinal McCarrick Is a Homosexual, Please Act.” The Prefect of the Congregation for the Doctrine of the Faith, Cardinal William Levada, and the Cardinal Secretary of State Tarcisio Bertone are immediately informed about it. Moreover, Viganò delivers a memo in this regard to the new Substitute Fernando Filoni. And while he’s at he attaches the memo of two years before, again underlining the gravity of the situation. But the reaction of the hierarchy is always the same: no response. It is thanks to Cardinal Giovanni Battista Re , the then Prefect of the Congregation for Bishops that Viganò came to know that Pope Benedict XVI , upon knowledge of Sipe’s denunciation, had ordered McCarrick to leave the seminary where he resided and prohibited him celebrating Mass publicly, participating in meetings, giving conferences and travelling, with the obligation of dedicating himself to a life of prayer and penance. It is the the Nuncio Sambi who communicates these measures to McCarrick, during a stormy meeting. Then, when Viganò becomes the Nuncio of the United States, it is precisely he who reminds McCarrick of the the Pope’s orders, who then merely mutters a confused reply attempting ineptly to minimize [everything]. But how did McCarrick manage to become what he became (Archbishop of Washington, and Cardinal, after being Archbishop of Newark) seeing his behaviour was what it was? If you ask this to Monsignor Viganò, he lays the responsibility of McCarrick’s career on Cardinal Angelo Sodano, Secretary of State from 1991 to 2006 and Cardinal Tarcisio Bertone, his successor. But Viganò involves also the present Secretary of State Pietro Parolin. When in fact it is clear to everyone that McCarrick does not obey Benedict’s orders and instead travels the world, Viganò also writes to Parloin asking if the sanctions are still valid , but his question remains answers – as usual - unanswered. Others who certainly knew, but kept silent, were, writes Viganò: Cardinal Levada, Cardinal Sandri, Monsignor Becciu (now a cardinal) and Cardinals Lajolo and Mamberti. In other words – everybody at the top. No less devastating, according to Viganò’s revelations, is the picture in the United States. Also there everyone knew, starting with Cardinal Wuerl, McCarrick’s successor in Washington, but no-one did a thing. And today Wuerl’s declarations, where he says he knew nothing “are absolutely laughable”. Regarding Cardinal Kevin Farrell, actual Prefect of the Vatican Ministry for the Laity, Family and Life, who, in turn, said he had never heard anything about Cardinal McCarrick’s abuses, Viganò writes: “Given his tenure in Washington, Dallas and now Rome, I think no one can honestly believe him”. At this point, however, the drama of Monsignor Viganò’s affidavit rises further in tone, as he implicates Pope Francis directly. The first eagerly awaited meeting of Viganò with the Pope has something of the surreal about it and leaves the poor Nuncio speechless. But the worst is yet to come. It is Sunday, June 23rd 2013. The Pope receives Viganò before the Angelus. He makes some statements that sound somewhat enigmatic to the Archbishop, then point-blank he asks him: “What is Cardinal McCarrick like?” To which the Nuncio replies: “Holy Father, I don’t know if you know Cardinal McCarrick, but if you ask the Congregation for Bishops there is a dossier this thick about him. 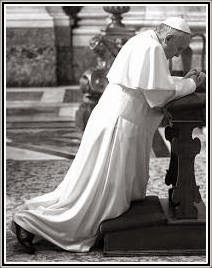 He corrupted generations of seminarians and priests and Pope Benedict ordered him to withdraw to a life of prayer and penance.” The Pope’s reaction? None at all. Actually, Bergoglio immediately changes the subject. Well, then wonders a bewildered Viganò , why did he ask me that question? He understood upon his return to Washington. He learns that between the Pope and McCarrick there is a close relationship. The question the Pope asked the Nuncio was thus a trap. The fact is that according to Monsignor Viganò’s account, since June 23rd 2013 at least, Pope Francis has known about the McCarrick case. At this point Viganò comments: “Pope Francis has repeatedly asked for total transparency in the Church and for bishops and faithful to act with parrhesia. The faithful throughout the world also demand this of him in an exemplary manner. He must honestly state when he first learned about the crimes committed by McCarrick, who abused his authority with seminarians and priests. “Now – continues Viganò - in the United States a chorus of voices is rising especially from the lay faithful and has recently been joined by several bishops and priests, asking that all those who, by their silence, covered up McCarrick’s criminal behavior, or who used him to advance their career or promote their intentions, ambitions and power in the Church, should resign. “I implore everyone, especially Bishops, to speak up in order to defeat this conspiracy of silence that is so widespread, and to report the cases of abuse they know about to the media and civil authorities. If this is true, and it is, how much graver is the responsibility of the Pope, the Supreme Pastor! Yet, sustains Viganò, in the case of McCarrick, the Supreme Pastor “not only did not oppose evil but associated himself in doing evil with someone he knew to be deeply corrupt. He followed the advice of someone he knew well to be a pervert, thus multiplying exponentially with his supreme authority the evil done by McCarrick. And how many other evil pastors is Francis still continuing to prop up in their active destruction of the Church! This is the stipulation, peremptory, in no uncertain terms: resignation. The only action that can aid recovery. The situation is dramatic, but Monsignor Viganò invites us not to lose hope.